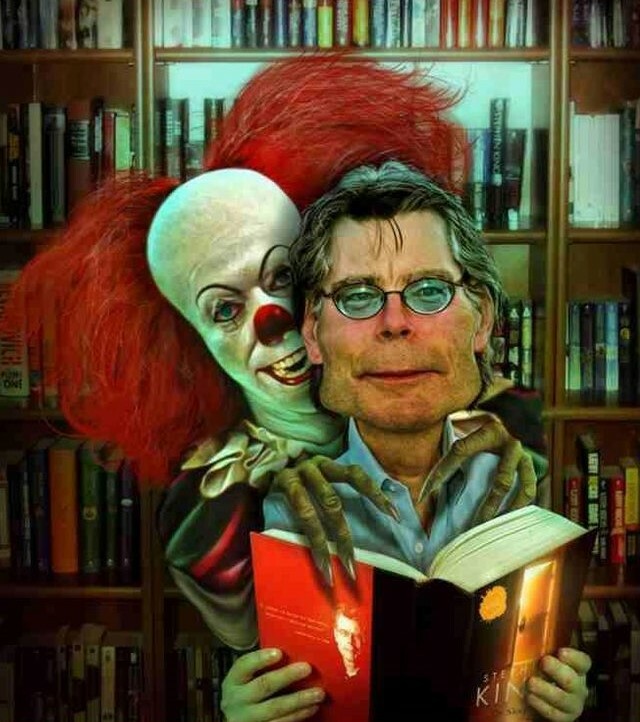 ‘We make up horrors to help us cope with the real ones.’ Stephen King. | Sally says . . . eat, sleep, work, read, play, draw, bark . . .
← ‘When you have seen one ant, one bird, one tree, you have not seen them all.’ E. O. Wilson. ‘We make up horrors to help us cope with the real ones.’ Stephen King. I have just had a trailer pop up on my computer screen for a remake of the movie based on the Stephen King novel ‘It’. Now I love Stephen King’s books (although the man is obviously seriously strange) and I read this book many years ago. I remember it as being very long (over 1000 pages), descriptive, convoluted, and, as you would expect, incredibly creepy. 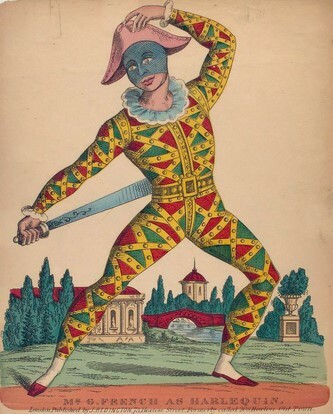 I also remember that the villain of the book liked to show up dressed as a clown . . . 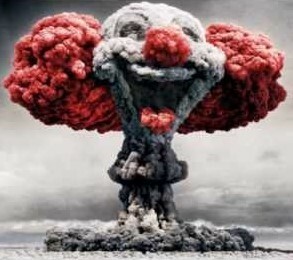 I assume people aren’t born having a clown-phobia (or are they?) so you would think that some sort of traumatic event in childhood concerning a clown would have to occur to bring on such dislike or a fear of them, but that can’t always be the case, can it? (Everyone in our college who doesn’t like clowns was traumatised by one as a child?? I doubt it.) I certainly don’t recall any such clown-trauma happening to me, but I still don’t like them. I wonder why that is? Maybe it’s as simple as just not being able to ‘read’ them like we can other people. Clowns’ facial expressions are fixed (and exaggerated) so it’s near impossible to gauge their true feelings. It was during the 19th century that the colourful, friendly, white-faced clowns we recognise today started to gain popularity. These clowns performed mainly for children and were meant to make us laugh. And for the most part they did. Until, somewhere along the line someone said, “You know, clowns kind of freak me out” and lo-and-behold movies like ‘Funland’, ‘Poltergeist’ and ‘Killer Clowns from Outer Space’ (and of course the original ‘It’) were born. If ever you had the tiniest reservation about how you felt about clowns any of these movies would have been enough to send you into full blown coulrophobia. So, now I have you all thinking about killer clowns—how many of you are going to watch the new ‘It’ movie? Me? No way. Not at the cinema anyway. I am much braver reading horror books than I am watching horror movies. I will probably wait until it (ha . 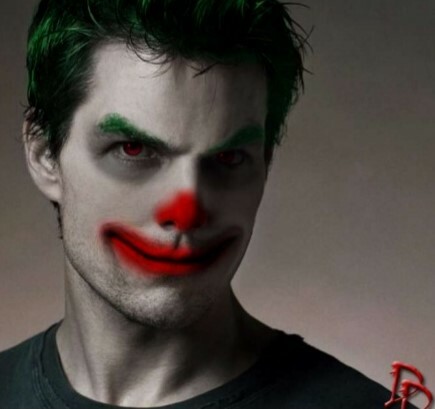 . . ‘It’ . . . see what I did there?) comes on the telly. Even then it will probably be on very late at night and I’ll actually have to record it so I can watch it in the full light of the next day . . . along with a big glass (or three) of wine, the ‘pause’ button of the remote at the ready, and my own little killer dogs close by to protect me . . . This post brought back memories of a very strange UK comedy (?) series called League of Gentlemen – anyone else seen it? I remember that series. They also made a (not very successful) movie as I recall. This explains why your sister won’t come to see ‘It’ with me! !